Herb Robert is pretty little pink-flowering herb that frequents ditches, walls, hedgerows and woodland all over Ireland. According to the “doctrine of signatures” widely adopted in the middle ages a plant with curative properties would reveal its divine purpose through its appearance. Because the foliage of Herb Robert turns a fiery red colour in the autumn, or where the plant grows in dry and exposed conditions, it was widely used to treat blood disorders and to staunch the flow of blood from wounds. The name Herb Robert is thought to come from the Latin ruber, meaning red; but an alternative explanation is that the plant was named after Robert, an early duke of Normandy who commissioned a celebrated mediaeval medical treatise. Yet another theory suggests that the name stems from the Robin (a diminutive form of Robert) of Robin Goodfellow, the impish sprite from English folklore also known as Puck who was immortalised by William Shakespeare in his play “A Midsummer Night’s Dream”. Herb Robert is a common, widespread plant that is shade tolerant and will grow almost anywhere. It occurs as either an annual or biennial herb with stems branching close to the base of the plant. Some of these stems grow upright while others sprawl along the ground, reaching lengths of between 10-50 cm (4-20 inches). The finely divided, palmate leaves are normally bright green and the entire plant is covered in tiny silvery hairs. Foliage turns red in autumn or when conditions are dry and exposed. In may the small pink flowers with a white centre that radiates out into each of five rounded petals begin to emerge and persist until late into the autumn. The flowers attract a wide range of native insect species that serve to pollinate the plant, but where cross pollination fails to occur the flowers can fertilise themselves. Herb Robert belongs to the genus Geranium, a name derived from the Greek “geranus”, which means crane. A close look at the plant’s seed pods, which are shaped like crane’s bills, reveals the inspiration for the name. When ripe these pods open suddenly to eject their payload of seed. With it’s pink flowers and green and red foliage herb Robert is regarded by many to be an attractive plant – and inspired the poet William Wordsworth to pen the words: “Poor Robin is yet flowerless, but how gay with his red stalks on this sunny day.” Yet not everyone shares the bards enthusiasm. The plant’s foliage emits a strongly disagreeable smell when crushed – a characteristic that has earned it local names like “Stinking Bob”. 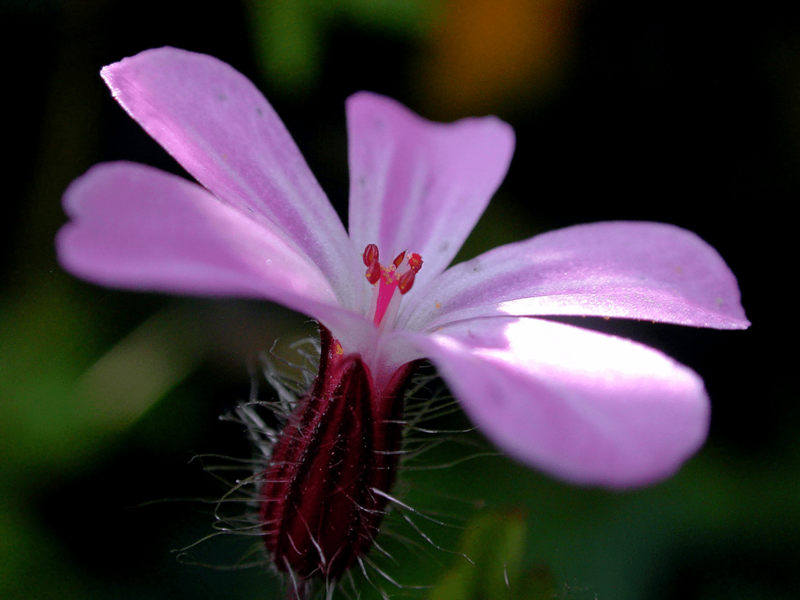 Herb Robert was once widely used to treat a range of medical conditions. The leaves were crushed to make compresses for bruises and wounds. It was taken internally for diarrhoea, peptic ulcers and bleeding, and applied externally to treat inflamed gums and herpes. The plant has also been used as a natural insect repellent and to obtain a brown dye. Although rarely encountered in contemporary herbal medicine recent research suggests herb Robert may lower blood sugar levels, making it a potentially useful treatment for diabetes.